The florists at Four Seasons Aberdeen know that our customers want only the best from us, which is why we are delighted to be able to offer this fantastic range of beautiful hand-tied bouquets for our customers to choose from. 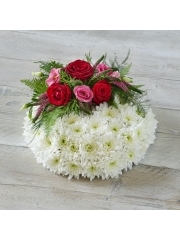 The hand-tied bouquet collection contains a fantastic range of different styles and colours, so that you can easily find something which appeals to your tastes from our website. However, if you are struggling to find exactly what it is you’re looking for from our collection, there is no need for concern. 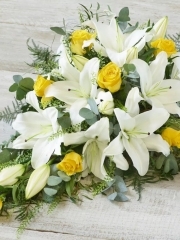 Our florists can provide unique hand-tied bouquets in a particular colour, or you can also consult the bespoke flower arrangement which we have on offer to order a bouquet which has been truly personalised for you. 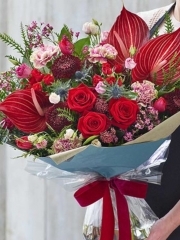 The florists at Four Seasons Aberdeen have over 40 years of experience in the floristry industry, meaning that your hand-tied bouquet will have been crafted with a great level of skill and expertise. Only the freshest flowers available to us are used in all of our flower arrangements, as we order flowers from our suppliers in Holland on a regular basis. This means that by ordering with us you will be able to appreciate some of the most beautiful flowers in Europe in your bouquet. The team at Four Seasons Flowers are dedicated to ensuring that all of our customers enjoy a positive experience with us, which is why we will carefully oversee your order until it has been safely delivered to you. You can count on us for a reliable delivery service, as your special hand-tied bouquet is in safe hands on its journey to you. We value clear communication with all of our customers, so you should not hesitate to get in touch with any queries or requests that we can help you with. Look no further than Four Seasons Florists for a glorious hand-tied bouquet today. The beautiful hand-tied bouquet that you’ve been dreaming of is closer than you think with Four Seasons Flowers. Not only are we able to offer you a fantastic bouquet of show stopping flowers, but Four Seasons Aberdeen are also able to deliver the flowers you order from us easily to your door. 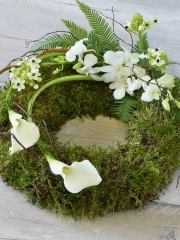 Flower delivery Aberdeen offers a great range of services for our customers to choose from so that we can sure that your flowers will be delivered at a time which suits you. Flower delivery Aberdeen operates flower delivery services throughout Aberdeen and the local area six days a week, from Monday to Saturday. Therefore, it is easy for our customers to choose a time and date which suits them for delivery. It is also possible to request a time slot in which you would like your delivery to take place, either morning or afternoon. 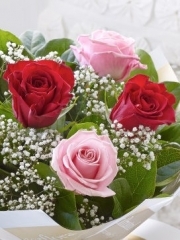 This means that your wonderful hand-tied bouquet will be delivered either before or after 1pm on the day in question. 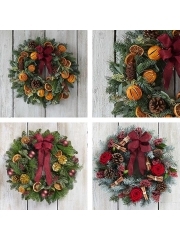 Same day delivery is also an option when ordering with Four Seasons Flowers, as this ensures that your flowers will be delivered to you on the very same day as you’ve ordered them. 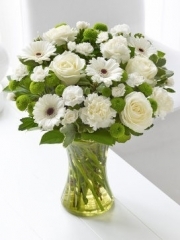 To be eligible for same day delivery, it is necessary that your order is placed with us before 3pm on the day in question, so that our florists have the time that they need to craft your splendid hand-tied bouquet with the care and attention that it deserves. 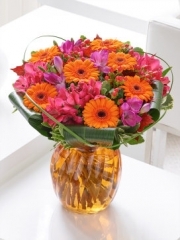 Flowers Four Seasons is also proud to be a member of the Interflora brand, which means that we are able to offer all of our customers a range of flower delivery services further afield should you so require. Choosing a hand-tied bouquet from Four Seasons Florists is a decision which is sure to leave you impressed.